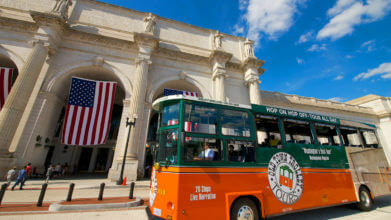 To get an overview of the city, take an Old Town Trolley Tour of Washington, DC. Complete with narration from knowledgeable and entertaining tour guides, the tour is helpful in planning the rest of your visit. The trolley takes you to all the major sites and allows you to hop-on or hop-off at many points of interest. You’ll also learn all about DC while you’re riding around the city, making this unique form of transportation a must-do for all visitors no matter how long you’re planning to stay. Also, children under the age of 4 ride totally free! Washington, DC is full of monuments and memorials. The Lincoln Memorial, Vietnam Veterans Memorial, Korean War Veterans Memorial and World War II Memorial are in the same area if you get off on Stop #11 of the trolley tour. The Martin Luther King, Jr. Memorial and FDR Memorial are nearby at Stop #10, while the Jefferson Memorial is located right across the Tidal Basin at Stop #9. Fortunately, when you’re in a time crunch, the trolley will drop off visitors in central locations close to these famous memorials. Each of these places honors the people who served and shaped the United States of America. DC is also home to some of the nation’s best and most famous museums. On a short trip, it can be difficult to decide which ones to visit. You could easily spend all day in each museum, so make these your priority on a first visit to DC: the Museum of American History, the National Air and Space Museum and the National Museum of Natural History. At the Museum of American History, you can spot Dorothy’s ruby slippers from the classic film The Wizard of Oz among thousands of other artifacts. The National Air and Space Museum is home to the Wright Brothers’ flyer and Apollo spacecraft along with many other planes and a realistic flight simulator. Finally, the National Museum of Natural History houses the Hope Diamond and other fascinating exhibits about dinosaurs, mammals and geology to name a few. Between these three museums, you’ll see many famous sights and enjoy family-friendly, indoor excursions. To learn more about American government and the political process, arrange a tour of the U.S. Capitol Building. It is best to plan ahead and book a tour online or through your Congressman in advance to avoid long lines. Include a two to three hour block of time in your schedule for a tour of the Capitol. After you’ve toured the Capitol Building, you can walk to the nearby Supreme Court. You might be able to watch some of the proceedings if court is in session. If you have time after touring the Capitol and the Supreme Court, stop by the National Archives for a look at the US Constitution, Bill of Rights and Declaration of Independence in their original forms. Founded in 1856, Old Ebbitt Grill is the oldest saloon in Washington, DC. The restaurant’s convenient location near the White House means you won’t have to travel far to eat good food. The restaurant’s atmosphere is family-friendly and people of all ages will be intrigued by the famous dinner guests of days past, including President Teddy Roosevelt, Alexander Hamilton and many more. The Hamilton is a recently opened restaurant near the White House designed to honor Alexander Hamilton. Its spacious dining area and delicious food, complete with a kids menu, make it an ideal family-friendly option for lunch or dinner. Downstairs, you’ll find a premier listening room where talented local and national artists perform live nightly. The Hamilton is great for a couple’s night out listening to live jazz musicians or a family lunch or dinner. Finally, the Mitsitam Cafe inside the National Museum of the American Indian is a unique find. Mitsitam’s authentic Native American dishes are full of flavor. The whole family can sample traditional and contemporary Native American food. To pack all this family fun into a few days, check out a detailed schedule about How to See Washington DC in 2 Days.